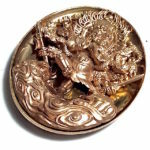 Rian Pra Maha Tanabodee Champala (Shambala) Brazenmetal coin amulets in a in Special Limited Edition Masterclass Amulet edition . 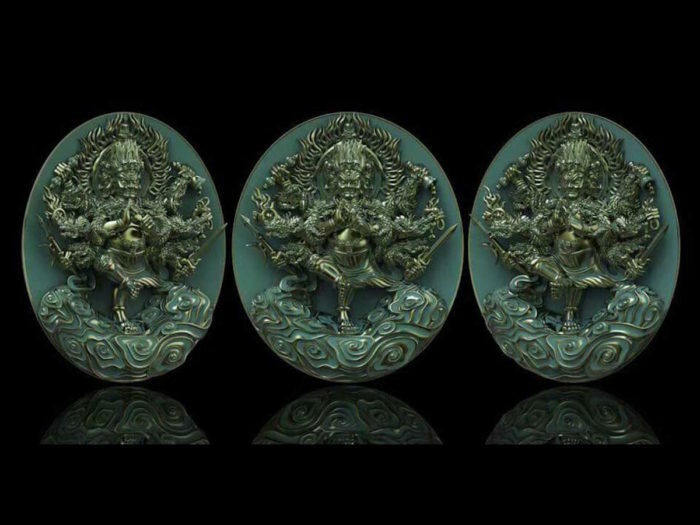 These metallic coin amulets are forged in the image of The Tibetan Vajrayana Deity Vaiśravaṇa, God of Wealth. The amulets were Blessed in special ceremony at the ancient forest temple of Borobudur in Indonesia. 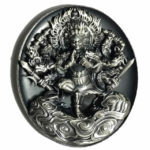 The front face of the amulet bears the polished brazen image of the Wrathful Vaisravana Deity with multiple arms bearing cosmic weapons, standing on the cosmic ocean with a flamed aura. 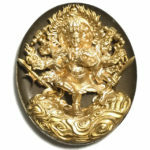 The deity protects from all evils, demons and black magick, and invokes high status and great wealth. 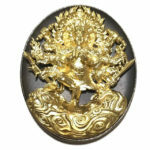 The guardian deity protects your empire and wealth, preventing dissemination of assets. This extreme limited masterclass series was taken to Indonesia to the ancient temple of Borobudur to be blessed under auspicious astrological alignments at the ancient shrine. Borobudur is a 9th-century Mahayana Buddhist temple in Magelang, Central Java, Indonesia, as well as the world’s largest Buddhist temple, and also one of the greatest Buddhist monuments in the world. The temple consists of nine stacked platforms, six square and three circular, topped by a central dome. The temple is decorated with 2,672 relief panels and 504 Buddha statues. The central dome is surrounded by 72 Buddha statues, each seated inside a perforated stupa. Built in the 9th century during the reign of the Sailendra Dynasty, the temple was designed in Javanese Buddhist architecture, which blends the Indonesian indigenous cult of ancestor worship and the Buddhist concept of attaining Nirvana. Borobudur is still used for pilgrimage; once a year, Buddhists in Indonesia celebrate Vesak at the monument. 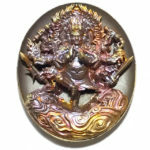 Vaiśravaṇa is the Sanskrit name of this Deity, who in Thailand is known as ‘Taw Waes Suwan Asura Deva’ is known by many names in different countries. Also called Vessavaṇa (Waes Suwan) (Pali; Tibetan: རྣམ་ཐོས་སྲས་, Namtösé, simplified Chinese: 多闻天王; traditional Chinese: 多聞天王; pinyin: Duōwén Tiānwáng, Bishamonten (毘沙門天)), is the name of one of the Four Heavenly Kings, and is considered an important figure in Japanese Buddhism. The character of Vaiśravaṇa is founded upon the Hindu deity Kubera, but although the Buddhist and Hindu deities share some characteristics and epithets, each of them has different functions and associated myths. 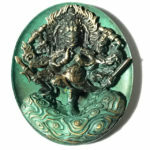 Although brought into East Asia as a Buddhist deity, Vaiśravaṇa has become a character in folk religion and has acquired an identity that is partially independent of the Buddhist tradition (cf. the similar treatment of Guanyin and Yama). Vaiśravaṇa is the guardian of the northern direction, and his home is in the northern quadrant of the topmost tier of the lower half of Sumeru. He is the leader of all the yakṣas who dwell on the Sumeru’s slopes. He is often portrayed with a yellow face. He carries an umbrella or parasol (chatra) as a symbol of his sovereignty. He is also sometimes displayed with a mongoose, often shown ejecting jewels from its mouth. The mongoose is the enemy of the snake, a symbol of greed or hatred; the ejection of jewels represents generosity. Vaiśravaņa’s mantra is Ōṃ Vaiśravaṇaye Svāhā. In the Pāli Canon of Theravāda Buddhism, Vaiśravaṇa is called Vessavaṇa. Vessavaṇa is one of the Cātummahārājāno or “Four Great Kings”, each of whom rules over a specific direction. Vessavaṇa’s realm is the northern quadrant of the world, including the land of Uttarakuru. According to some suttas, he takes his name from a region there called Visāṇa; he also has a city there called Ālakamandā which is a byword for wealth. Vessavaṇa governs the yakkhas – beings with a nature between ‘fairy’ and ‘ogre’. Vessavaṇa’s wife is named Bhuñjatī, and he has five daughters, Latā, Sajjā, Pavarā, Acchimatī, and Sutā. He has a nephew called Puṇṇaka, a yakkha, husband of the nāga woman Irandatī. He has a chariot called Nārīvāhana. He is called gadāvudha (Sanskrit: gadāyudha) “armed with a club”, but he only used it before he became a follower of the Buddha. Vessavaṇa has the name “Kuvera” from a name he had from a past life as a rich Brahmin mill-owner from Sri Lanka, who gave all the produce of one of his seven mills to charity, and provided alms to the needy for 20,000 years. He was reborn in the Cātummahārājikā heaven as a result of this good karma. As with all the Buddhist deities, Vessavaṇa is properly the name of an office (filled for life) rather than a permanent individual. Each Vessavaṇa is mortal, and when he dies, he will be replaced by a new Vessavaṇa. Like other beings of the Cātummahārājika world, his lifespan is 90,000 years (other sources say nine million years). Vessavaṇa has the authority to grant the yakkhas particular areas (e.g., a lake) to protect, and these are usually assigned at the beginning of a Vessavaṇa’s reign. When Gautama Buddha was born, Vessavaṇa became his follower, and eventually attained the stage of sotāpanna, one who has only seven more lives before enlightenment. He often brought the Buddha and his followers messages from the gods and other humans, and protected them. He presented to the Buddha the Āṭānāṭā verses, which Buddhists meditating in the forest could use to ward off the attacks of wild yakkhas or other supernatural beings who do not have faith in the Buddha. These verses are an early form of paritta chanting. Bimbisāra, King of Magadha, after his death was reborn as a yakkha called Janavasabha in the retinue of Vessavaṇa. In the early years of Buddhism, Vessavaṇa was worshipped at trees dedicated to him as shrines. Some people appealed to him to grant them children. In Japan, Bishamonten (毘沙門天), or just Bishamon (毘沙門) is thought of as an armor-clad god of war or warriors and a punisher of evildoers. Bishamon is portrayed holding a spear in one hand and a small pagoda in the other hand, the latter symbolizing the divine treasure house, whose contents he both guards and gives away. In Japanese folklore, he is one of the Seven Lucky Gods. Bishamon is also called Tamonten (多聞天 lit. “listening to many teachings”) because he is seen as the guardian of the places where the Buddha preaches. He is believed to live halfway down Mount Sumeru. He is also associated with Hachiman. 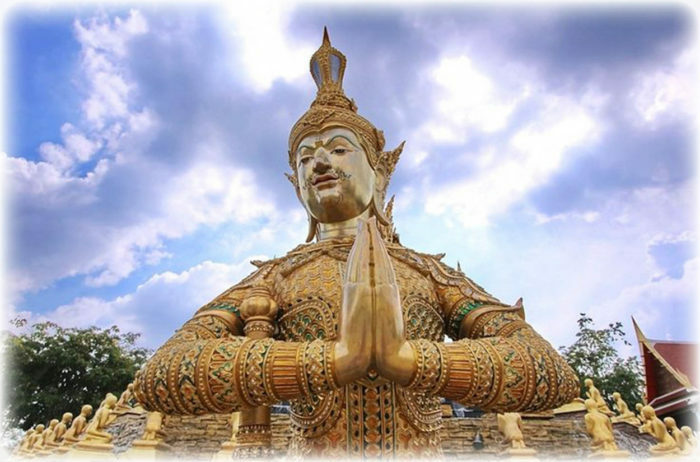 In the Thai Buddhist Pantheon of Deities, Vaiśravanฺa is known as ‘Taw Waes Suwan’. In Thai Buddhist Cosmological Pantheon, the four directional points of the compass have a Deity allocated to each direction. The deity allocated as the Lord of the North is “Tāw Guwen” (Guberan), or more commonly known as “Tāw Waes Suwann” (the word “Tāw” meaning “Lord”). In Bhuddhist tales and Fables he is known by his Pali name Waes Suwann, or Waisarawan (Derived from Sanskrit). 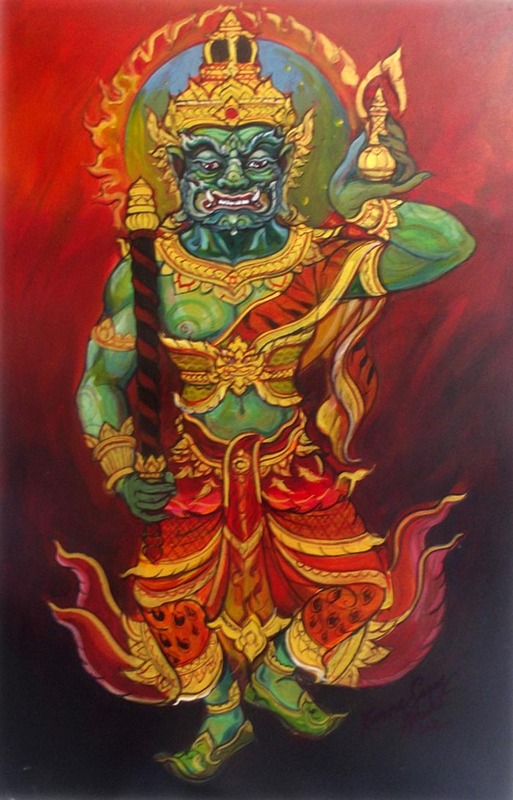 In both Thailand’s Ramakien version of the original Hindu Brahmin Epic “Ramayana” of the Hermit Vaslmiki, the name of this Being is “Lord Kubera” (Taw Guberan). 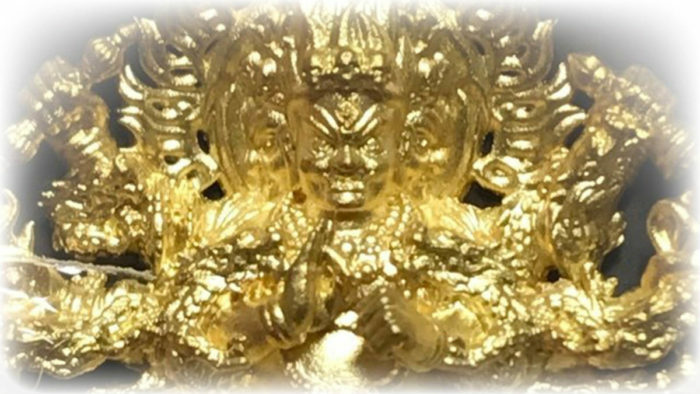 Taw Waes Suwan Asura Deva is The Lord of all Rich Fortunes and the Northern directions. He has other names, such as Tanesworn, Waisarawan, Yanksaraja, Raaksentorn, Ratanakan, and Aitawita (son of Itawata). 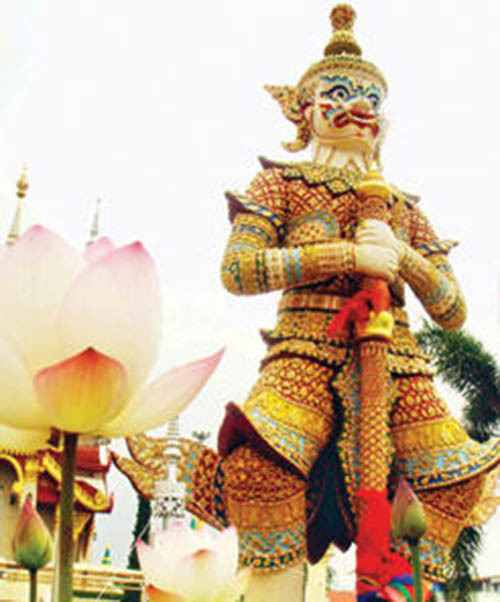 Taw Waes Suwann is seen guarding the entrance to most Thai Temples, and is highly revered by Thai Buddhists as the lord of Great Fortune and Riches. “If any Maiden appears again in this my place of practice,she will instantly bear the fruit of her immodesty, and seem as if she has a secret lover, and have to live in shame. None of the Maidens returned to bother the Ruesi, until, one day, a Celestial virgin by the name of Itawita, who was the daughter of Lord Tarawintu (who knew nothing of the Ruesi’s curse), entered into the ceremonial area of the Ruesi in the forest, and itawita was instantly transformed into a pregnant woman. She instantly ran home in shock to told her father what had happened. In some cosmologies, the directions are split into eight; Phra Intr the East, Phra Plerng the South East, Phra Yom South, Phra Atidt SouthWest – Phra Pirun in the West, Phra Pay North West, Waes Suwann in the North, and Phra Jantr in the Northeast. Phra Intr (indra) also bestowed a magical mobile dais (chariot throne) to Lord Waes Suwann, capable of going anywhere the owner wished to. 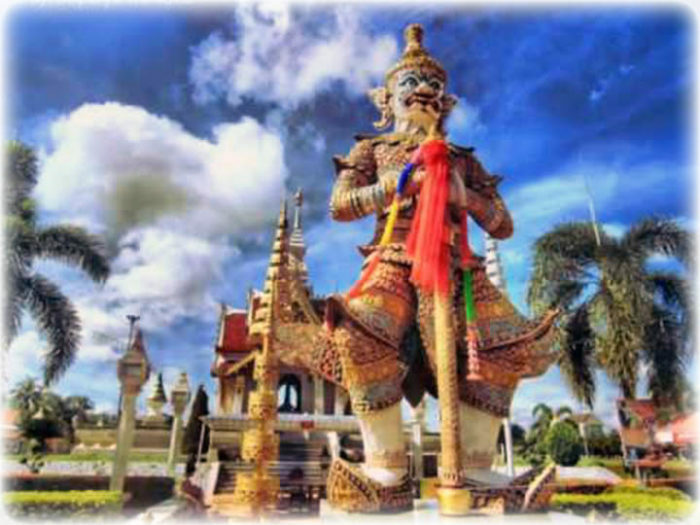 One day, Sumalee came up for a wander from Mueang Badan (Badala – the Underworld realm of Nagas), and saw Lord Waes Suwann flying in the sky on his magic dais, and he became jealous, and planned a scheme to overtake the rule of Langka.Sumalee convinced his daughter “Nang Nisa” to go present and offer herself to Lord Lasataya (Baolast), Waes Suwann’s father, who accepted and they gave birth to four children in all. 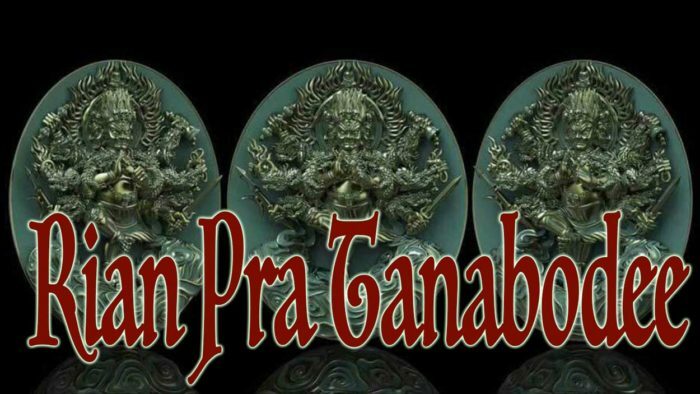 1.Totsagan (Ravana) 2. Gumpagan (Kumbhakana) 3.Nang Samanagkhaa 4. Pipek (Bhibheka). This means that Lord Waes Suwann is the older half-brother of Totsagan on his father’s side. In that time Lord Waes Suwann was lord and ruler of Langka, but later Nang Nisa convinced Totsagan to overtake the rule of the city and take the power from Lord Waes Suwann. Totsagan was even shameless enough to steal his magic dais too. The magic dais was able to travel anywhere one’s heart wished, but there was a special rule; It was forbidden for a lady who has had three husbands to ride on the chariot/dais. One day, Nang Montoe (Totsagan’s wife), got on the chariot, and the thing came to a halt, it was no longer possible to be moved. Nang Montoe was first the consort of Palee, after which she became Totsagan’s queen, whilst married to Totsagan, the Monkey general of Phra Ram’s (rama’s) army, Hanuman, once shape-shifted into the likeness of Totsagan and duped Nang Montoe into sleeping with him.Nang Montoe is therefore considered to have had three husbands. As Lord Waes Suwann came to have to lose rulership of Langka, id caused Brahma to feel sorry for him, as he was such an honorable being, so the Deity conjured up a new City for Lord Waes Suwann, and Named the City “Wasutaraa”, or, “Wasusatalii”. This Mythical City is told to have been located in the Himalayan mountains. A second legend says that, after Lord Waes Suwann lost the City of Langka To Totsagan, he went to reside on the mountain of Khantamat (คันธมาทน์), which was a legendary and Divine place, with only beautiful sights to behold; there was a mystical pond as a place of Residence called Nalinii, whose water would spring up like a fountain and sprinkle down from the air like soft rain or a watery mist. The palace in the center of the pond where Taw Waes Suwann and the other Yaks lived was called “Pakalowadii”. 1. Taw Tadtaratha – Lord of the East 2. Tāw Wirulabpaks – Lord of the South 3. Taw Wirunlahog – Lord of the West, and 4. Tāw Waes Suwann – Lord of the North. 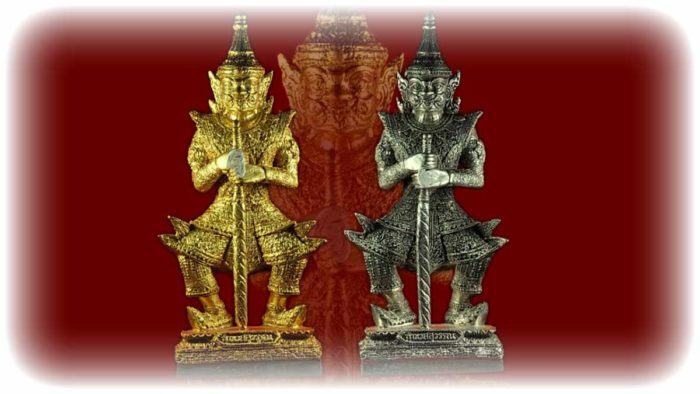 Taw Waes Suwann’s weapon is traditionally the club (known as “Grabong” in Thai).This club is one of four supernatural weapons, namely; 1. the Vajra of the God Indra (called “Wachira” in Thai), 2. the eyes of “Phra Yom” (Yama), 3. the special cloth of Aalaawakayaksa and 4. the “kataawut” of Taw Waes Suwann (the club).This club has the power to be flung through the air and crack the heads of many thousands of Yaks in one single throw. Taw Waes Suwann was actually able to cause them to lose their lives, but in his mercy, would only ever crack their heads, in order to teach them to be better behaved.For this reason, Thai people tend to use Taw Waes Suwann statues and amulets to fend of Demons and malevolent beings, as well as putting a “Pha Yant” (Yantra Cloth) with his imaged imprinted on it along with some Kata in Khom script above the door of their houses to prevent thieves and ghosts from bothering.